4 Seater Turned 2 Seater with Long Wheel Base. The Seats, Pedals and Steering Wheel Were Moved Back 12" to Center Weight. New Driving Position is Very Comfortable. - This Is NOT a Wrap- It's Paint With Gold Leaf Detail and Three Coats of Clear- sick! 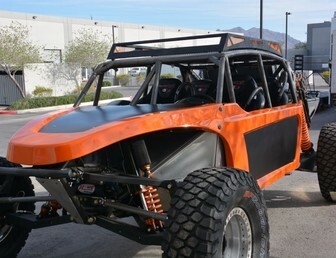 - Rear Torsion Sway Bar, Factory UTV Skid Plate, Method Bead Locks, 32" Tensor Tires. - The Factory Motor, Drivetrain and Cooling Were Untouched to Ensure Reliability. - Less Than 10 Miles on the Car...Yes, Only 10 Miles During Photoshoot ! Have More Than $80k in Car and Build. Car is unreal, spotless and truly one of a kind built with only the best products available! Can you imagine a set of paddles on this beast?